Our line of Chewie bars are unique to Blondie’s Cookies, these bars are made from several different kinds of cookies to which we add rich velvety condensed milks, butters and a few secret ingredients to create this deliciously soft, chewy bar. 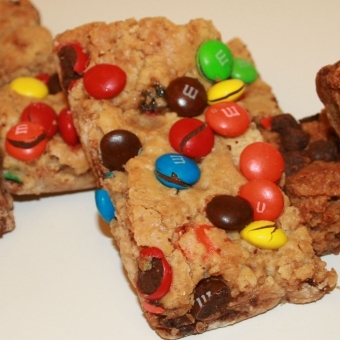 Our M&M® Chewies are made with rolled oats, raisins, cinnamon, and more. These are the best way to eat your trail mix. With one of these in your back pack, you will be ready to hike any mountain. Size: -- SELECT -- M&M ® Chewie 6 ct.M&M ® Chewie 9 ct.M&M ® Chewie 12 ct.